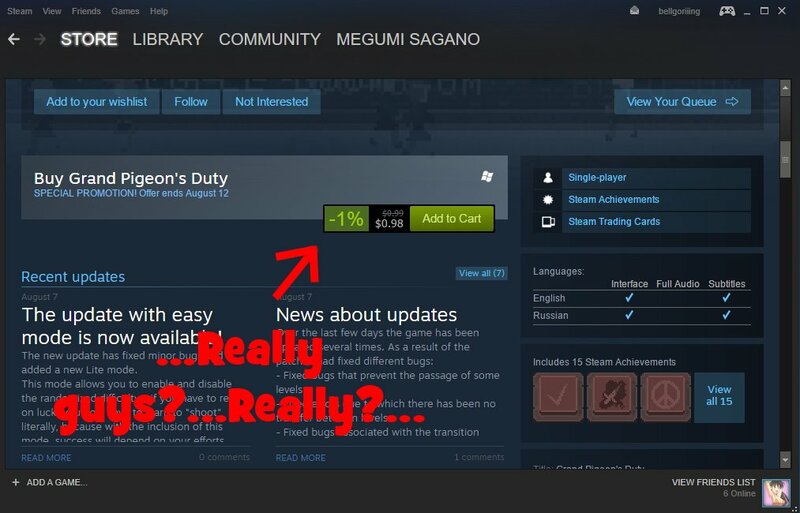 MAJOR steam discount is going on for a game, guys. Definitely going to pick up Megatagmension Blanc and Devil May Cry 4: Special Edition. I might pick up Skullgirls along with the Encore upgrade because I enjoyed the game on PS3 and I definitely want to do the story with the added voices. "187 items from your Steam wishlist are on sale!" I've got 163 on sale on my wishlist, but I've already got a couple of games that I'd really like. Pity Rimworld isn't on sale. I bought The Elder Scrolls Morrowind today. Only played like half an hour, but I'm pumped to dive into another Elder Scrolls game. I'm also considering Shadow of Mordor, as well as Vampire the Masquerade: Bloodlines. Turns out I've got plenty of non-essential games in my wishlist. I need to get a bit more selective next time I go exploring game queues. Dynamite Alex is at 49 cents. Missileman Origins is at 99 cents. Okay, why is everything after a certain point in bold? What's going on with the formatting in this thread? I have a bunch of games on my Steam wishlist, but... meh. I haven't bought a game on Steam in years. And that's not likely to change anytime soon.